Auntie M is at her writing group, workshopping the opening to the new Nora Tierney (The Golden Hour, for those of you who are wondering what the next color will be). 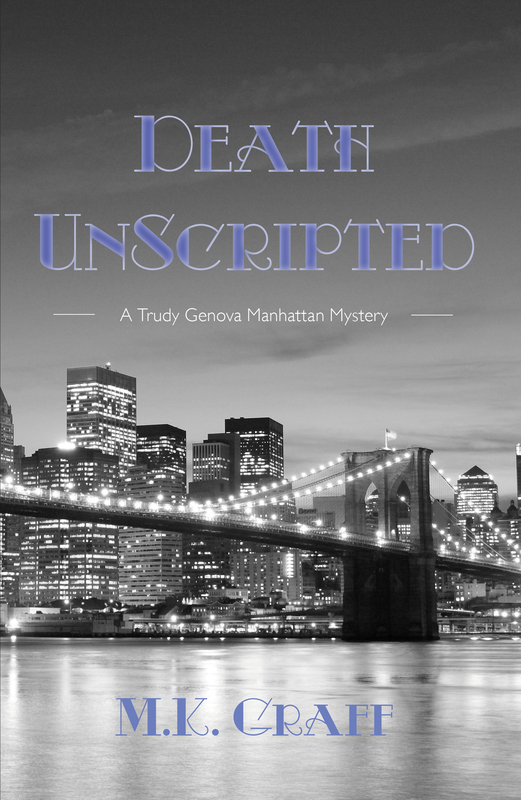 The cover is completed on Death Unscripted, the first Trudy Genova Manhattan Mystery, and she’ll reveal that shortly. In between writing my ScotShop and Biscuit McKee mystery series, I sometimes go off on tangents of sheer whimsy. One of these inspired moments came as I sat beside the creek in my back yard a few years ago, mulling over how I was going to handle Biscuit. I ended up revising what I’d written and using it in the regular monthly column I wrote for the Atlanta Writers Club. Then a publisher grouped six years of those columns together in a workbook—the easiest book I ever had to write. Spring is a good time to take up where I left off last fall and begin to write outdoors. Even if you have a laptop, why not step outside and write with a pencil, just for the fun of it? Pencils have been around since 1565. Anything that’s lasted that long must have a few things going for it. Let’s see, a pencil . . .
2.	runs without batteries. For that matter, it can run without brains, but I hope that’s not the case here. 3.	has an eraser, the 1565 version of a delete key. 4.	provides a handy canvas for tooth imprints. I’ve never known anyone who hasn’t occasionally chewed on a pencil. What computer gives a frustrated writer that kind of alleviation? I don’t group solitaire, Sudoku, or Candy Crush in the same league with a yellow number 2 Ticonderoga. 5.	can be thrown across the path / room / deck when simple erasure or chewing isn’t active enough (see numbers 3 and 4 above). 6.	can be sharpened without a fancy gadget. My Swiss Army knife works just fine. If the circumstances are dire enough, I can even sacrifice a fingernail to tear the wood back away from the graphite. 7.	can be broken in half to fit in a tiny notebook or a small pocket. Of course, this eliminates the delete function of one-half of it, but I can use the bare half for my Journal of Work in Progress. That Journal isn’t edited, after all. It just gets me rolling and gives me a chance to air those vague ideas. And the just plain stupid ones that will never show up in my finished manuscript, but need to be released from my psyche before the good ideas can roll out. Go ahead. I dare you. Try writing outside, under a tree or on a deck or next to a lake. All because of a simple pencil. Over the years since I originally wrote this, I’ve continued to follow my own advice. Pencils—and the ideas they seem to generate—have saved my story line most than once. Only last night, my fourteenth-century Scottish ghost wouldn’t stay where I wanted him to be. I kept pounding away at the keyboard, trying to force a recalcitrant character into my (sort of) outline, and he kept growling at me with that wonderful Scottish burr of his: I dinna wish to go there, my lass, and ye canna make me do it. Finally, in disgust, I brewed a cup of tea, grabbed my spiral-bound notebook and my trusty pencil, headed for the loveseat in my living room, chewed for a moment or two (see number 4 in the list above), and began to follow him where he wanted to go. His journey was, I must admit, much more interesting than what I’d had in mind. Could I have followed him just as well on the computer? Well, okay; I admit the possibility. But the pencil gave me a good excuse to put my feet up, thereby jostling my muse (the cat who had to move her perch when I relocated). Obviously, the newer, better ideas began to flow. 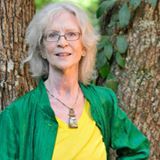 Fran Stewart is the author of the Biscuit McKee Mysteries – GRAY AS ASHES is the seventh book in that series – as well as a standalone mystery – A SLAYING SONG TONIGHT. Her non-fiction work includes FROM THE TIP OF MY PEN: A WORKBOOK FOR WRITERS. 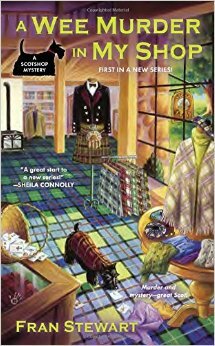 Her new ScotShop Mystery Series from Berkley Press begins with A WEE MURDER IN MY SHOP. She sings alto with a community chorus and volunteers at her grandchildren’s school library. 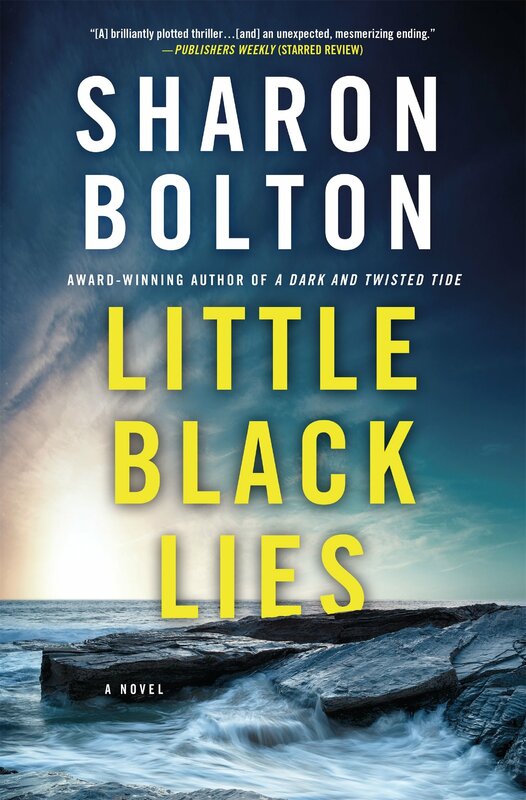 She is a member of the National League of American Pen Women, Sisters in Crime, and Mystery Writers of America. Readers can add Renee Knight to their growing list of UK authors who will keep you flipping pages and waiting their next book in this startling thriller. DISCLAIMER presents a very creative and original premise. What if you picked up a book to read, only to find a hidden part of your life documented in the guise of fiction, down to the clothes you were wearing on a specific day, and that book ends with your horrific death? This is the nightmare that hits Catherine Ravenscroft, a documentary filmmaker, which also happens to be Knight’s background. Catherine and her lawyer husband have just moved house to downsize. Their only child, 25 year-old Nicholas, is finally living on his own and they are still unpacking boxes when Catherine comes across the book that will change all of their lives. 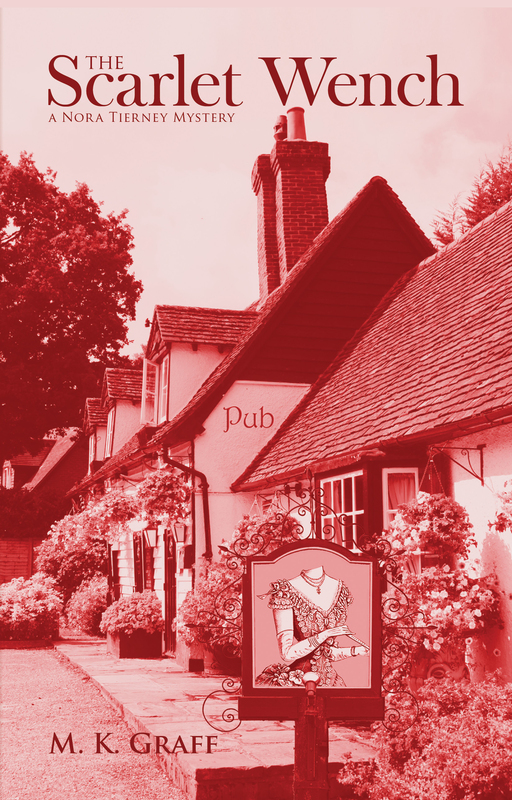 The Perfect Stranger is the pseudo-fictinal account of a day Catherine thought she’d stored in her memory banks, written by one Stephen Brigstocke. Suddenly the tension ratchets keenly, as the details are parsed out of the incident she’d rather forget: a vacation to Spain whene her husband was called home early, leaving her and young Nick alone for a few days to finish the trip; the young stranger who seemed fascinated with her; the day her son almost lost his life. Many of the chapters are told from the point of view of Stephen, the man who has published the book that destroys Catherine’s life, and we see his reasons clearly as the story unfolds. His wife, although long dead, extends her influence, as does his son. Just when you think you know what has happened, everything turns and twists into something else entirely. The nightmare extends and extends again as every aspect of Catherine’s life becomes infected by the story of those lost days in Spain. Her husband turns on her; then her son; then her colleagues. 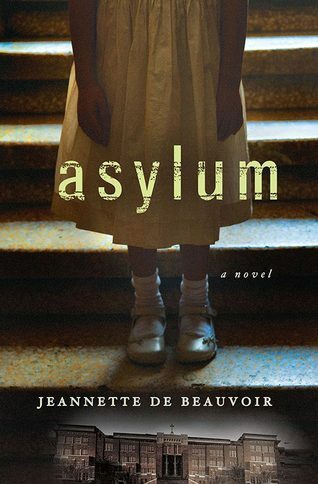 This was a book Auntie M found tough to put down. It creeps into you much in the manner of S. J. Watson’s Before I Go to Sleep. You’ll be waiting for Knight’s next one~ and for the film shortly to go into production. But read the book first. It will grab you all the way through to its unsettling ending. A terrific psychological thriller the centers on revenge, guilt, grief and hiding the truth. This year (2015) is a busy one for me, seeing the release of three novels and a short story, from various publishers throughout the world. Of course, it isn’t only the publications that will keep me on my toes; I’m also hard at the keyboard writing another two novels, along with everything else that goes with being a working author these days. I’m not complaining. I like busy. I love writing. I also enjoy meeting and speaking with readers, both old and new, so I think this will be a good year. For anyone unfamiliar with my name, I’m best known for my Joe Hunter thriller series. Hunter is an ex-soldier from England, now working in the USA as a PI, bodyguard, and sometimes vigilante. Sometimes Hunter can be uncompromising when it comes to dealing with the bad guys of the world, but he’s a good guy at heart. He has been compared to Jack Reacher, Travis McGee and Joe Pike, but he’s also his own man. To date in the UK there have been nine Joe Hunter books published by Hodder and Stoughton, and number 10 is just a few short weeks away from hitting the shelves on June 4th. 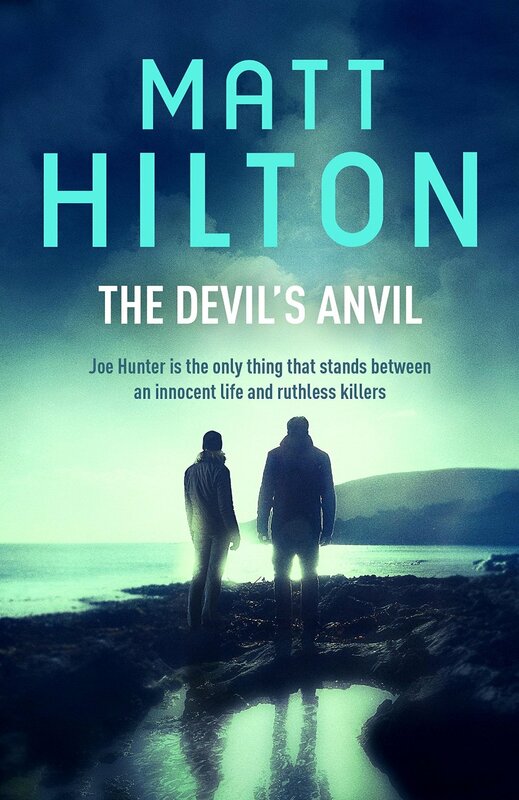 In The Devil’s Anvil – Joe Hunter 10 – Hunter accepts the task of protecting Billie Womack. The job is a no-brainer for the ex-counterterrorist soldier, but it comes with its own set of complications. Billie’s husband, Richard, stole thirty million dollars from some violent people. He apparently died in a car crash with Billie’s daughter, Nicola, during a desperate attempt to elude his pursuers. But his enemies don’t believe him dead. They think he escaped the plunge into the icy river that killed Nicola and has now decided to come back for the money. If he’s alive, they believe he’ll contact Billie. It doesn’t take long for the bad guys to arrive at her remote farmhouse. Soon she and Hunter are fugitives. Dead or alive, Richard’s fate means nothing to Hunter, but he promises to do everything in his power to protect the grieving mother. Even if it means taking a bullet for her, it’s a price he’ll pay. It’s a price he will come to regret. 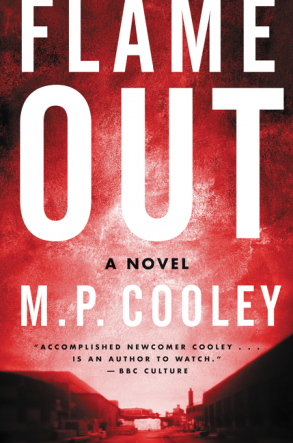 Publication of the Hunter series in the USA is a little behind the UK, and to date six novels have been published by William Morrow and Company (Harper Collins), with book 7 recently published by Down and Out Books. 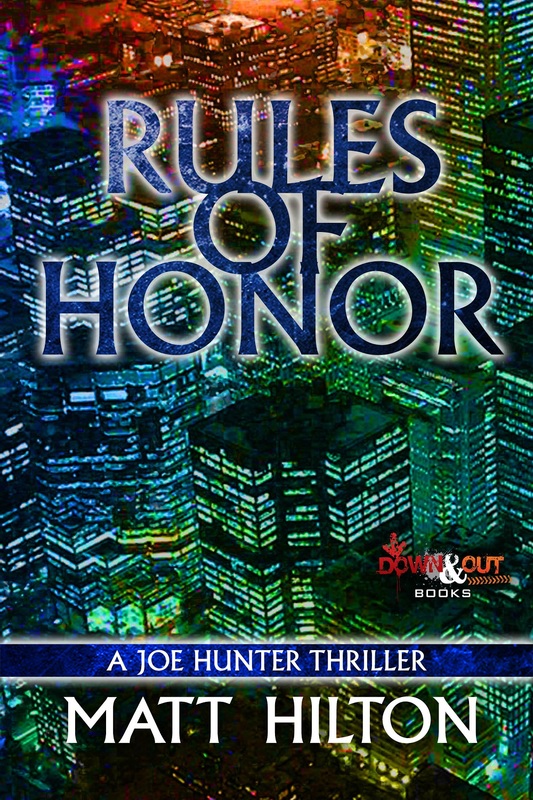 This June also sees the publication by Down and Out Books of book 8 called Rules of Honor. Chaney dropped his phone and went for his gun, already turning as he rose. Rink struck him with the edge of his hand, a chop to the side of the big man’s neck. Uncontrolled the blow could kill, but Rink had tempered the force. It was still enough to stagger Chaney and while he was weakened, Rink took the gun from him with a practiced twist of the wrist. Chaney grunted something, continued his turn and tried to grapple for the gun. Rink hit him again, a sweeping elbow strike that contacted with Chaney’s face and knocked him back a few steps. Rink followed him, bringing up the Glock he’d liberated to point it directly at Chaney’s forehead. I hit the button and the door swept open. As I entered the carriage my view of Rink was slightly obscured by Chaney’s thick body. I had a horrible feeling that Rink would shoot, and the bullet would go directly through Chaney’s skull and hit me. I sidestepped, placing myself in the open next to the exit doors. Rink was taller than Chaney, and I knew he’d seen me from the slight narrowing of his eyes. That was all the notice he gave me, though, because his attention was on the man he was about to kill. Rink didn’t even look at me. Nausea squirmed a passage through my gut. ‘I don’t want to,’ I said. ‘That’s something, at least.’ Rink ignored me then and took a step nearer Chaney. ‘I’m about to kill you,’ my friend snarled. I knew then that there was less than a heartbeat to spare. The short story I have upcoming is called After the Red Rain Fell and is a complete left-turn from my Joe Hunter output. I was chuffed to bits when Geoff Brown, editor in chief at Cohesion Press asked me to contribute to their SNAFU anthology series, and I jumped at the chance to exercise my horror-writing muscles again. Anyone who has been following me will probably know that I also write horror and supernatural tales and have published various novels in these genres as well. 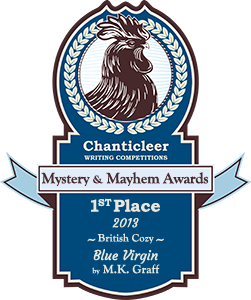 I was also the creator of the webzine Thrillers, Killers ‘n’ Chillers and you can probably tell from the name that I’m comfortable writing in the various genres it encompasses, and love nothing more than mixing the genres up when I’m allowed. 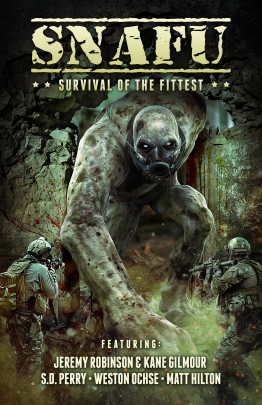 After the Red Rain Fell is probably best described as a military-horror with a Spec-Ops team coming up against a nightmarish extraterrestrial terror loosely inspired by ‘The Blob’, ‘The Thing’ and ‘Aliens’. It is also firmly based on a true event from a few years ago where Indian scientists discovered bacterial life forms living in our outer atmosphere where I’ve pondered the age old question: What if? My tale will feature in SNAFU: Survival of the Fittest. Taking another step away from Joe Hunter, I’ve a new series starting this year, with November as the launch month for Blood Tracks. It’s the first in a new mystery series featuring Tess Grey and Nicolas ‘Po’ Villere, and sees the mismatched pair – one an ex-cop, the other an ex-con – attempting to trace a witness in the steamy bayous of Louisiana, before a murderous killer can get to him first. My readers can expect the same level of excitement as they’re used to from Hunter, but also stories that are more whodunit in nature. Severn House will publish Blood Tracks for the UK market this November as I said, but the US editions will not hit shelves until Spring 2016. So, there you are. I’m going to be busy, busy, busy. But in between all the business, I’ll still be busy writing too, with “Joe Hunter 11” and “Tess and Po 2” both vying for my attention. Matt Hilton quit his career as a police officer to pursue his love of writing tight, cinematic American-style thrillers. He is the author of the high-octane Joe Hunter thriller series, including his most recent novel The Lawless Kind – Joe Hunter 9 – published in January 2014 by Hodder and Stoughton, and the upcoming The Devil’s Anvil – Joe Hunter 10 – coming in June 2015. His first book, Dead Men’s Dust, was shortlisted for the International Thriller Writers’ Debut Book of 2009 Award, and was a Sunday Times bestseller, also being named as a ‘thriller of the year 2009’ by The Daily Telegraph. Dead Men’s Dust was also a top ten Kindle bestseller in 2013. The Joe Hunter series is widely published by Hodder and Stoughton in UK territories, and by William Morrow and Company and Down and Out Books in the USA, and have been translated into German, Italian, Romanian and Bulgarian. 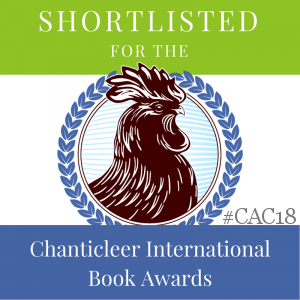 As well as the Joe Hunter series, Matt has been published in a number of anthologies and collections, and has published novels in the supernatural/horror genre, namely ‘Preternatural’, ‘Dominion’, ‘Darkest Hour’ and ‘The Shadows Call’. He is currently working on the next Joe Hunter novel, and editing a new thriller novel called Blood Tracks, soon to be published by Severn House.